Published March 30th 2011 by Amazon Digital Services, Inc. Remember the old Disney movie? Check out this classic book written in 1812. If you like history, it might interest you to know that this was the start of the War of 1812, or the second war for American independence. It’s also the Regency Era and when Jane Austen busily wrote. 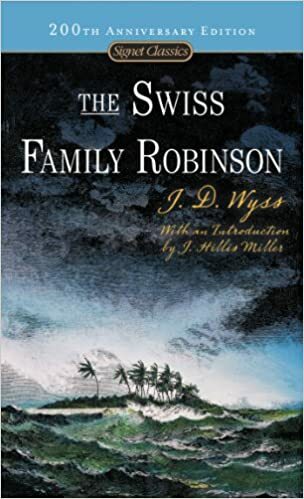 An interesting fact about Swiss Family Robinson, the family’s surname was not Robinson. The name is used to refer to Robinson Crusoe, who the family reference several times throughout the novel. Note: They also mention Gulliver’s Travels! As you read, enjoy the many teaching moments between Father and children. They luckily wash ashore an island with everything they need to meet their needs and are quite industrious. This comes from the author wanting the book used as a method to teach his own children. While certainly not a text to dive into hard sciences, you can learn an awful lot about the natural sciences from the text. I enjoyed the glimpse into science as the people of the time understood it in comparison with what we know today. I read this book as a child and my sons read it as part of our homeschool curriculum. I love these books that come alive as you read them. The Kindle book is free and with Librivox, the e-book is free for your listening pleasure. I combined reading with audio as I drove, a tactic I use often. It is nice to hit the classics and enjoy books from my youth. If you’ve never read Swiss Family Robinson, now’s the time! If you are lucky, you can find the Disney movie and watch it with your family and compare the two. I’ve never read this book, so it is interesting to hear that their family name is not Robinson. Do they have a last name? It was quite interesting to learn this fact myself. I always thought they were just a Swiss family named Robinson! How silly since Robinson is not the most Swiss of names, right? I’m not sure we are ever told the family’s surname. Because of reading this, I now want to re-read Robinson Crusoe. I read that so long ago that I have forgotten much of it. I’m hoping to add that to my reading for this year as well as Robin Hood.